If you want a stylish, fun-to-drive, fuel-efficient car with utility, you might think you need to buy a small, sub-compact city commuter. 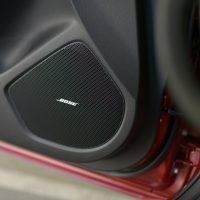 But it’s all available in the Mazda3 hatchback. 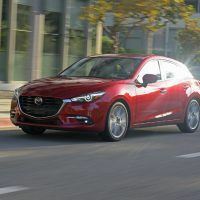 Mazda is producing some fun entries and this one competes well with popular rivals like the Volkswagen Golf, Honda Civic, and Ford Focus. 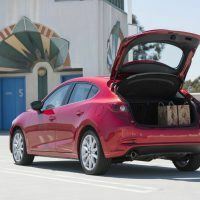 This week we drove the 2018 Mazda3 5-Door Grand Touring, which is the top trim. 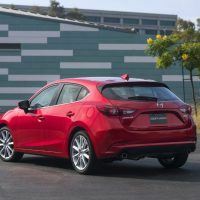 The Mazda 3 remains mostly unchanged for 2018, with a shuffling of some features and option packages. Our Grand Touring tester had LED headlights as standard equipment. 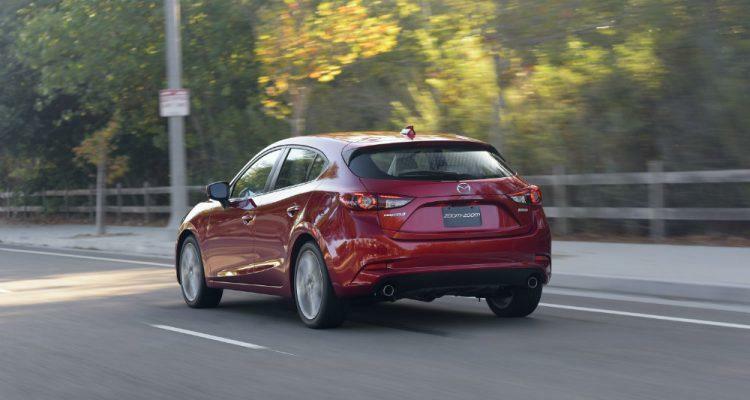 Our 2018 Mazda3 5-Door Grand Touring ($24,945) came standard with LED exterior lights (headlights, foglights, taillights), a sunroof, digital speedometer, an upgraded display in the instrument panel, leather upholstery, a nine-speaker Bose system, and satellite radio. The Premium Equipment package ($1,600) added adaptive headlights, automatic high beams, a heated steering wheel, paddle shifters, an auto-dimming rearview mirror, navigation, lane departure warning and intervention, adaptive cruise control, forward collision warning with braking for higher speeds, and a traffic sign reader. The Appearance Package ($1,750) added a rear spoiler, front air dam, rear bumper skirt, and side sill extensions. Total MSRP including destination: $29,770. 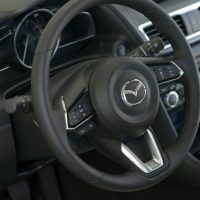 When we stepped inside the Mazda3, we thought the cockpit was truly driver-focused. Everything is centered on driving enjoyment, with all the controls arranged symmetrically around the driver. The heads-up display is available to make it easier to have fun driving this sporty hatch. 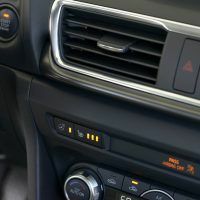 The electronic emergency brake is another small thing some might not notice, but it provides room for the gear shifter to be optimally placed. 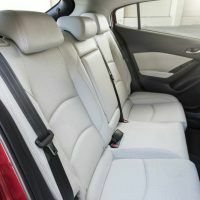 The leather-trimmed front seats are supportive, comfortable, and among the best in the class; we think they’re near-luxury level. 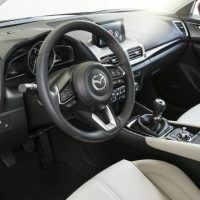 Mazda has some of the best interiors for this price point of any automaker. 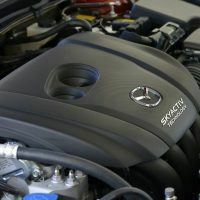 The quality of materials is top notch and the fit and finish is excellent for a vehicle under $30,000. In the back, there’s 35.8 inches of rear legroom, so taller passengers will feel cramped. It’s fine for short rides, but not long road trips. When it comes to cargo space, the hatch is among the best. 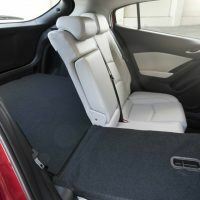 The 5-Door Grand Touring offers 20.2 cubic feet behind the rear seat. 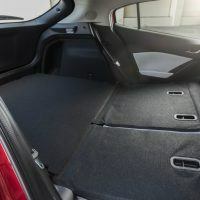 With the seats folded flat, it offers up an abundant 47.1 cubic feet of cargo space, moving it into small SUV territory. 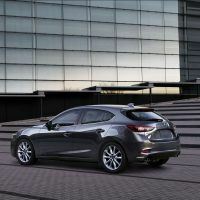 The Grand Touring comes powered by a 2.5-liter engine, producing 184 horsepower and 185 lb-ft. of torque. It’s mated to a six-speed automatic with Sport Mode and paddle shifters. It’s a front-drive configuration and gets an EPA-estimated 26/35 city/highway and 30 combined mpg. The first thing we noticed after getting behind the wheel was the heads-up display. It’s one of the best features for any driver so you can keep your eyes on the road. We like it because we push our testers to the limit. 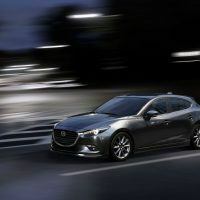 The 2.5-liter had ample power for most driving situations, and small hatch buyers will like the four-cylinder with the automatic because of the excellent fuel mileage. The 6-speed Sport Mode automatic is ideal for enthusiasts because it offers steering wheel paddles, and it shifts with the decisiveness of a dual-clutch transmission. 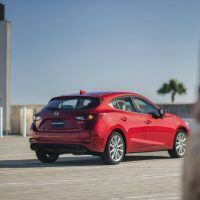 Mazda says “Driving Matters” and this car is a good example of what they transfer to the driver. 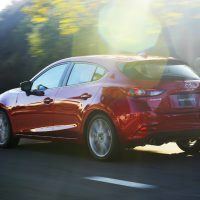 We found the Mazda3 handles the tightest curves and mountain roads like more expensive German sedans. The ride can be a bit busier than most compact cars and somewhat stiff because the suspension is tuned for sport over comfort. But that’s why you would buy this car: for the driving enjoyment. 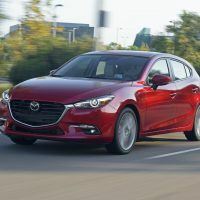 The 2018 Mazda3 5-Door Grand Touring is one of the best hatchbacks for the money. It not only ramps up the fun-to-drive meter, but it offers functionality, sporty styling, a top-notch cabin, excellent fuel economy, and safety. If it were offered with all-wheel drive it would be even better. 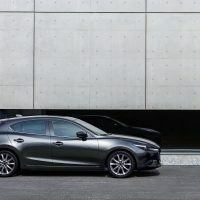 2018 Mazda3 5-Door official site. 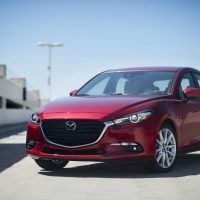 Photos: Mazda North American Operations. 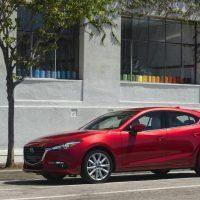 No Comments on "2018 Mazda3 Hatchback Grand Touring Review"